Last week was a crazy week. I endured my first weekend alone with the kids as well as a baby who is refusing sleeping quite frequently. However, today is gorgeous, I got my run in and baby girl is going on hour three of her nap. Freak accident? I'm pretty certain. But I'll take it! Now that I have time to get some match ups together, here are some great deals you can grab at CVS! --Oral-B Stain erasing toothbrush - $9.99 and get $4 ECB. Use $2 off (March or April PG). Final Price: $4.99 after ECB. Any other great deals you found this week? We then headed downstairs for our early afternoon bottle. I carefully snapped up her bib and even placed an extra burp cloth over his outfit in case of any spit up disasters. Just as she was finishing her bottle, I had said to her, "Lola you look so dang cute today I can't handle it!" And no less than ten seconds after I said that she expelled the most unladylike, manly and gruesome noise I've ever heard come from her body. My legs suddenly got super warm and I knew what had just happened. 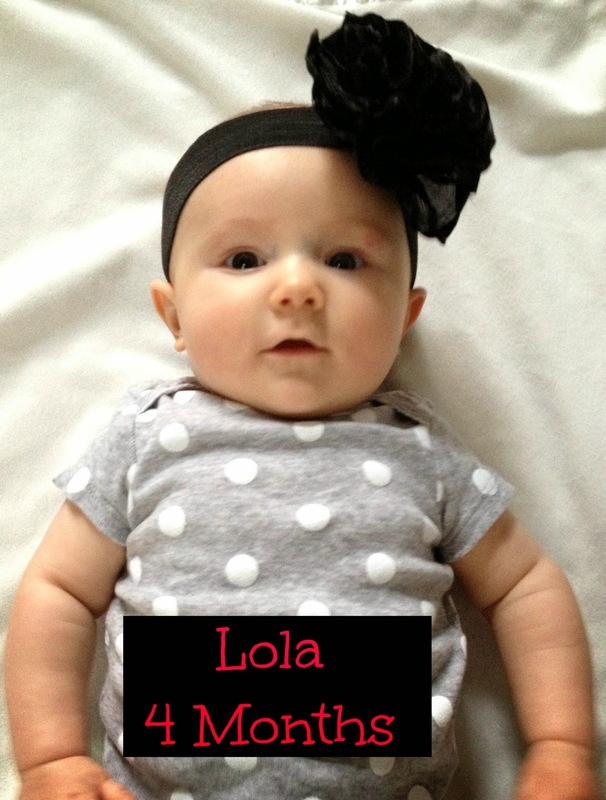 Lola had the world's biggest blowout in her most adorable outfit ever. I should have known this was going to happen, duh. I mean, once those words came out of my mouth I had jinxed myself immediately. Not only did this blowout mean I had to change (sigh.) her adorable outfit BUT I had to get my active stain fighter mixture on is ASAP. Moms, I'm here to use my story as an example. I'm here to save the day from these untimely and despicable blowouts. Let me introduce you to a product that will save you from these wretched incidents that no mom wants to, nor has the time to deal with these days. 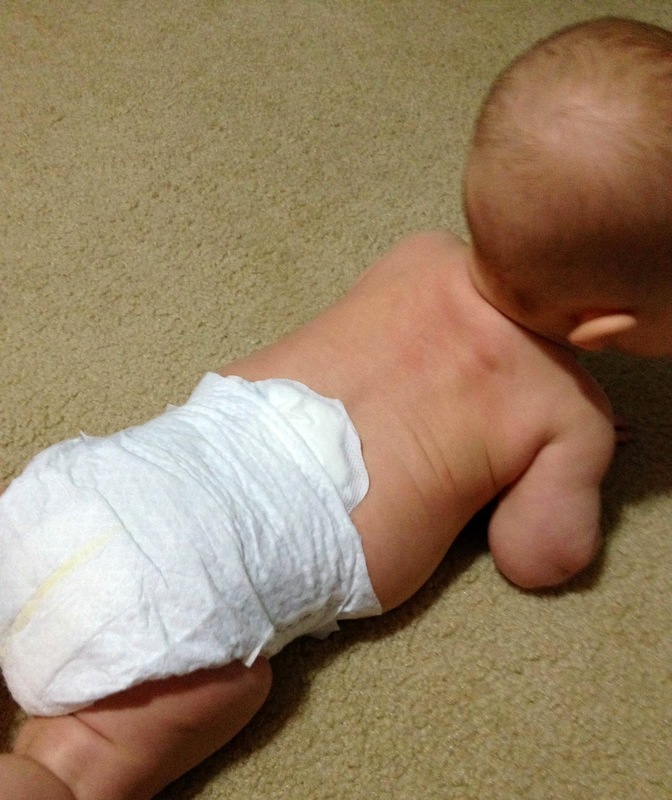 BabyBackups are hypoallergenic pads that fit between the waistband of the diaper and your baby's back. 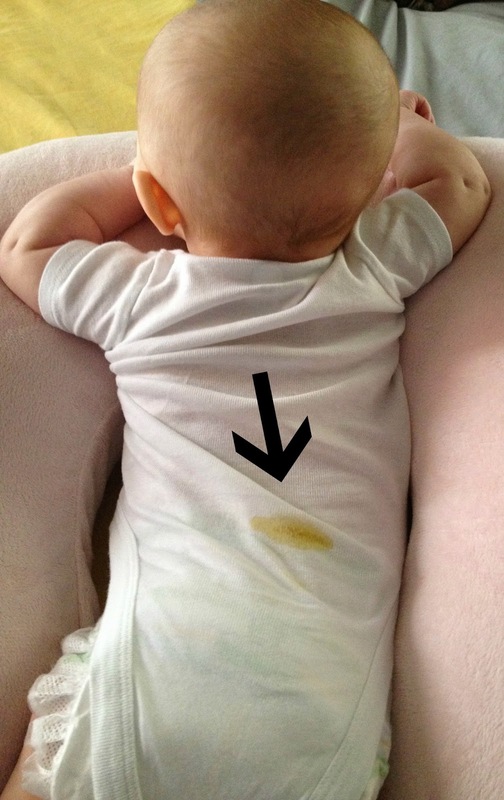 Basically you stick them on any brand of diaper and they keep those blowouts right where they are supposed to stay - in that diaper! 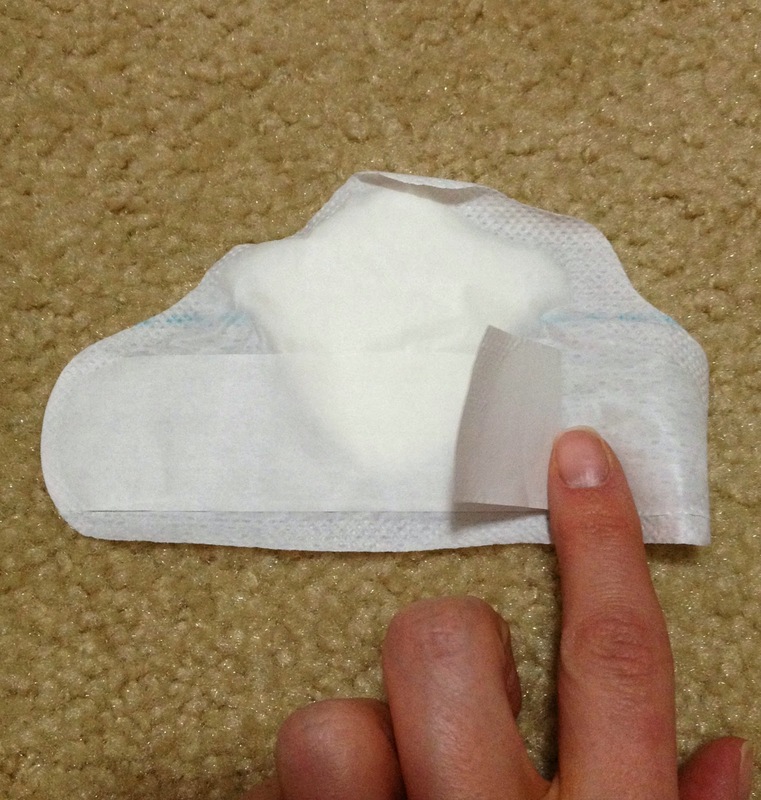 Peel off the adhesive strip cover and press the pad into the top of the diaper. 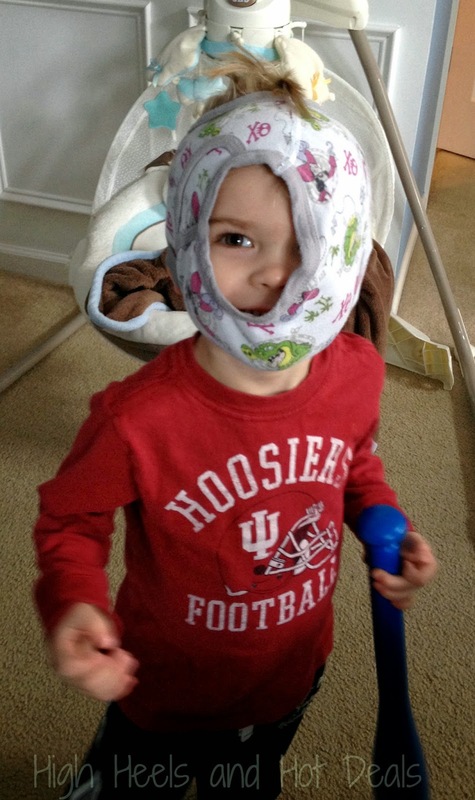 Once you've placed your BabyBackup, diaper up your babe! Easy as that my friends! Another great feature of the BabyBackups are the blue alignment indicator that helps you make sure you have placed the pad in the right place quickly and effectively. 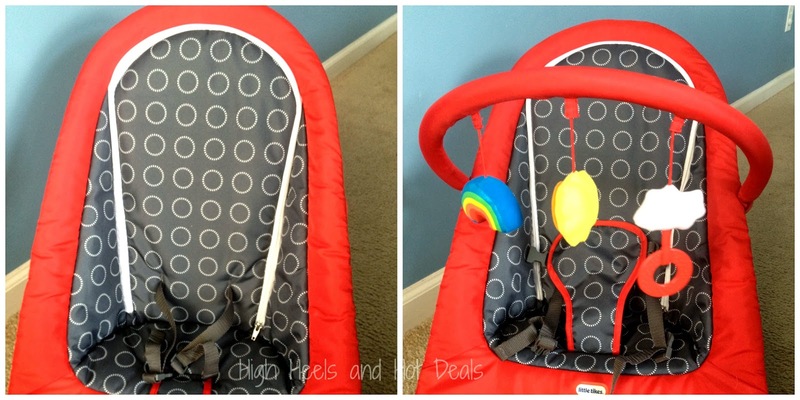 We know how important that is when you have a wiggle worm of a little one! Plus BabyBackups come with a convenient travel pack so you can throw your pads in your diaper bag to make sure you have them wherever you travel. Blowouts can and will happen anywhere, so it's best to be always be prepared! But want to know what's even better? Five, yes five lucky readers will win their own set of BabyBackups and a travel pack to make sure you are prepared wherever you may go! 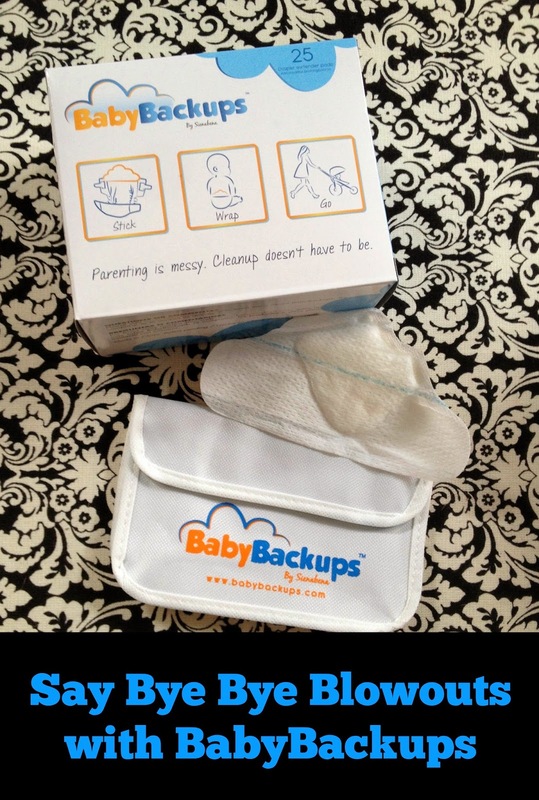 For more information, be sure to check out their website to shop for your BabyBackups. Once again in the blink of an eye my little sweet pea has turned another month older! Lola girl is officially 4 months old and I'm not sure if it's possible to love her anymore. She is definitely transitioning from newborn to baby and my heart is slowly breaking. My official back-to-work-date is April 21. That breaks my heart even more. However, my amazeballs college sitter is coming to watch her at our house for the last seven weeks of school. I can totally do seven weeks, right? Just praying to God we don't get anymore random snowstorms. Wouldn't surprise me unfortunately. 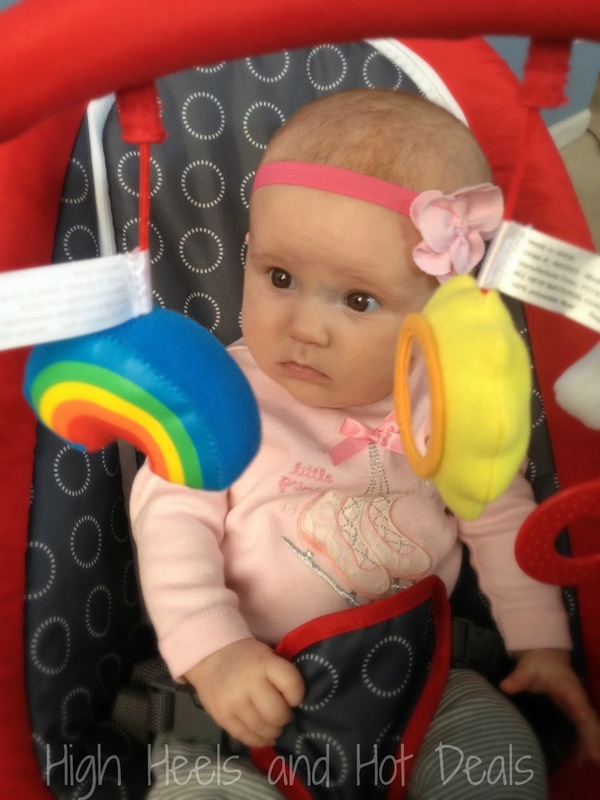 Size: We go on Friday for her 4 months appointment (and shots - wah!) but I'm thinking she's around 14 lbs. She is super long and has outgrown some of her jammies because her poor little toes are curled up in the feet. She is definitely in 3-6 month clothes and 6 month jammies. Most of her 3 month onesies are too short in the arms too. I'm having anxiety about packing away a lot of her baby clothes. I wasn't ever like this with Cohen but with Lola it's hard for me to see the clothes go away. Warm weather needs to hurry up though because her closet of rompers and dresses is calling her name! Eating: Lola eats four 5 ounce bottles a day and a 7 ouncer before bed. During the day she goes anywhere from 3 and half to 4 hours between bottles. We started oatmeal in the evenings and girlfriend is loving it! I'm hoping she drops her middle of the night bottle here soon and then we'll do oatmeal in the morning and at night. Sleeping: Well, this has now turned into a touchy subject. We are officially in our crib now for naps and night. She goes down around 7:30, wakes up for a bottle around 4 or 5 and then is back down until 8 or 9. However, the naps lately are giving me ulcers. We are lucky to get three 30 minute naps a day. That's it. Umm, help? She's obviously tired because she will be so grumpy and grouchy. It's just annoying to keep going into her room and rocking her back to sleep or putting the paci back in and patting because 5 minutes later those dang peepers are wide open on the monitor. She is still swaddled and I've tried not swaddling but it doesn't matter - 30 maybe 40 minutes if I'm lucky. Any tips moms? 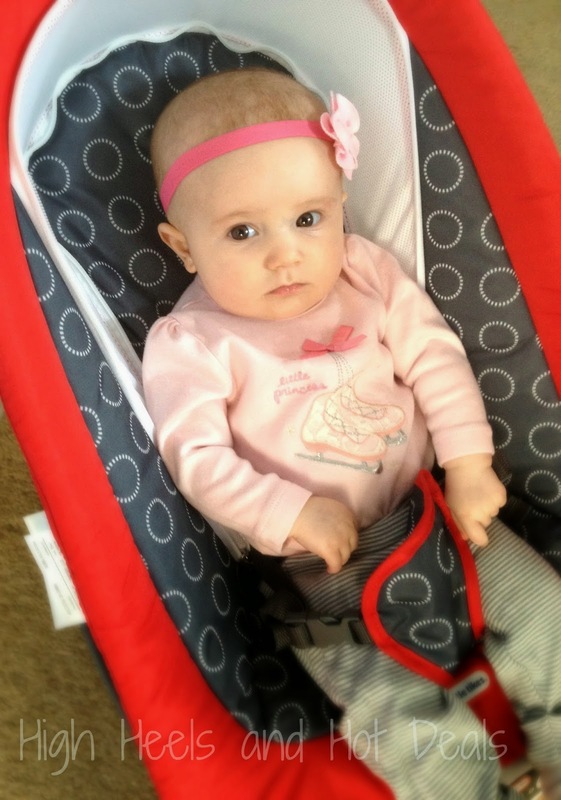 Likes: Lola loves music and has become quite fond of Baby Einstein. On her super fussy nights or days, I may put a short Baby Einstein video on and the girl is glued to the T.V. She also loves to be held (of course) and when people talk to her. 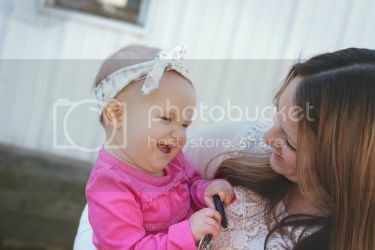 Her laugh is such a sweet little giggle. One of her favorite snugglies is her Bun Bun from cousin Sara. She loves kisses too and will open her mouth open big and wide - it's hilarious. Cohen has become quite fond of her sweet cheeks too because I'll often hear him say - "I'm going to kiss your cheekies," and then smooches away. Dislikes: Naps. The kid hates naps just like her brother. Lord help me. Am I doing something wrong? She also hates waiting for her bottle. There have been a few times at night you'd think she hadn't eaten in days by the sound of her cry. Kid likes to eat I guess. 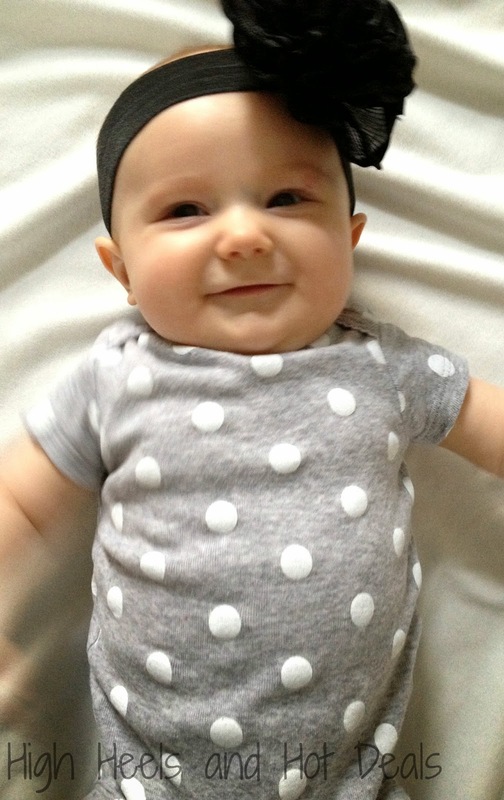 Milestones: Sweet little Lola rolled from her back to her tummy yesterday. It was hilarious watching her get that chubby leg over her body. But she did it like a champ! She still hasn't rolled from her belly to back but once the rolling is more consistent I'll have to get her out of that swaddle. She is also in her crib full time and sleeps 8-10 hours at night before waking up for a bottle. Lola also experienced her first outdoor run with me last week when we ran 8 miles together! This little girl is just a sweet little pumpkin. I feel like time is just flying by with her whereas with Cohen I was so excited for the next month and milestone. Don't get me wrong, I am always excited to see what happens next but this time around I'm really just soaking up all of my snuggles and baby time. I'm pretty sure we are working on our bottom teeth because the diaper rash and drool have been out of control. I was looking in Cohen's calendar and he had four teeth by five months. 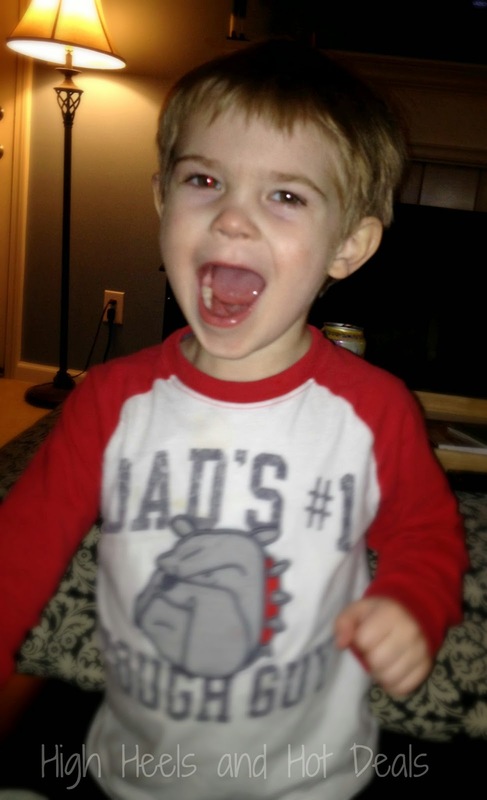 The kid was ready for steak dinner by a year with a full mouth of chompers. Now if the warm weather would just hurry up because the plethora of rompers in her closet must be worn before she outgrows them. Plus I need to get out of my winter funk and get out on some outdoor runs before I have to head back to work! 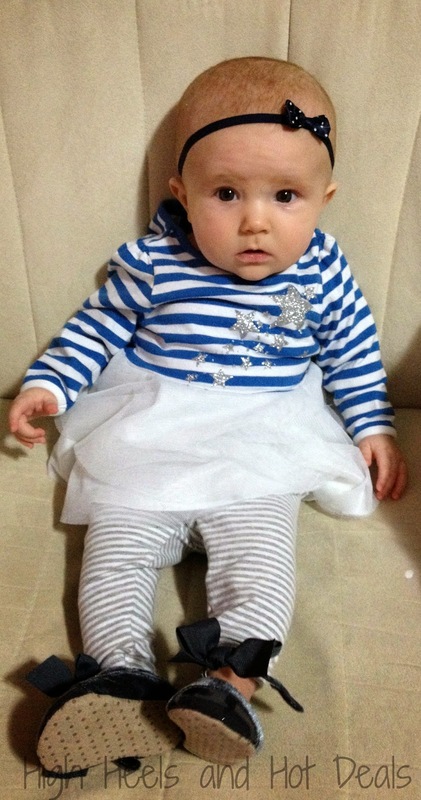 Happy 4 Months my Sweet Little Girl! I played sloth all weekend long. Seriously. I'm trying to catch up on my lack of sleep from last week as well as house chores, laundry and of course blogging. --Colgate Total toothpaste, mouthwash or toothbrush - 2/$6.98 and get $2 ECB back when you buy 2. Use $1/Toothpaste or $1/mouthwash or $1/toothbrush (SS 3/9). Final Price: $1.49 each when you buy 2 after ECB. What deals did you find at your CVS store this week? Wowzers this was a rough week. I was supposed to log 24 miles this week and only got to 18. I missed my 3 mile run Tuesday because the stroller was in Kurtis' car (which was a shame because it was a whopping 70 degrees that day!) and today I only got in 5 miles and just stepped off the treadmill because honestly I was bored. I can't even show you my weekly progress on my Nike+ program because I didn't get in my full 24 miles. Okay to be completely honest I'm totally bummed out with myself that I didn't make this week's mile goals. However my body is completely exhausted. Lola is going through a horrible sleep regression (I'll update you on this soon) and I feel even more tired than I did when she was a newborn. I know the 18 miles I did log is still great, but it's not what I was aiming for with my training. My plan is to still be able to run the entire race - snail speed if needed. As long as I'm outside, I'm really fine when it comes to distance. Well, unless I have a 30+ lb stroller and 834928394 hills and inclines. But I'm confident I'll be able to reach this goal. That's all folks! Until next week...I shall keep running! This has been a long and hard flu season. Mainly because it is the never ending winter here in Indiana. I'm so tired of being cooped up in my house that I jump on chances to get out and help Cohen burn off some of that winter stink! However, when you go to public places you know there is no way to avoid them. Yes, them. Them being GERMS. Probably because I'm a teacher, I'm a huge germaphob. I carry around hand sanitizer and anti-bacterial wipes to clean hands and wash surfaces every five minutes. I'm just crazy like that. But now that we have an infant in the house, I'm even crazier when it comes to those nasty germs. Cohen loves his sissy. He hugs and kisses her any chance he gets. But being at school all day with eleven other two and three year olds, you can only imagine the plethora of germs I'm sure he brings home. I have started teaching him good hand washing techniques to help him learn the importance of clean (and germ free) hands so when he does touch her, she isn't being infected with the plethora. 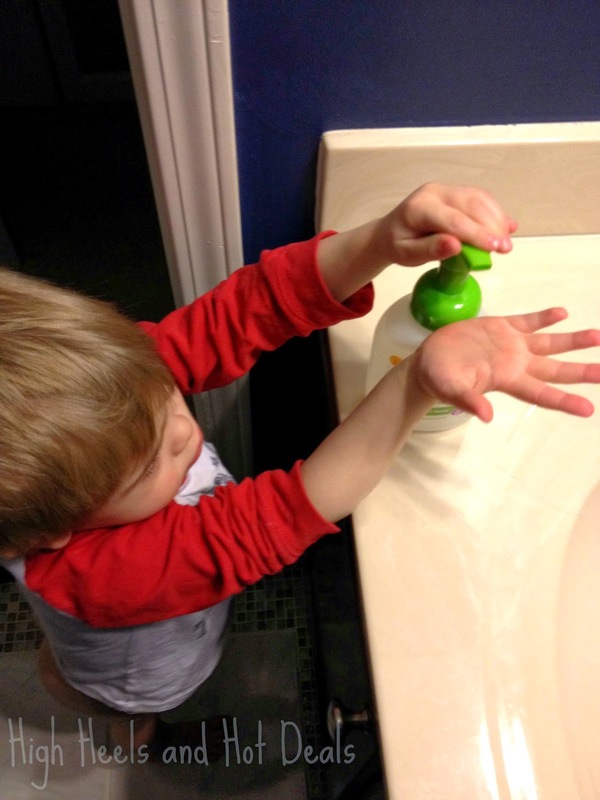 BabyGanics Foaming Hand Soap has been the perfect tool to help teach Cohen these healthy habits. We have a little stool in our bathroom and he loves to jump up and push the pump to get the foam in his hand. It helps that he can see the soap in his hand as he washes them. The Vanilla Lavender scent is subtle yet just yummy enough that I don't feel like it's overkill after every hand wash. Another great thing about the BabyGanics Foaming Hand wash is the moisturizing aspect. Cohen's poor hands are chapped and his knuckles bleeding because of the rough soaps he's been using. 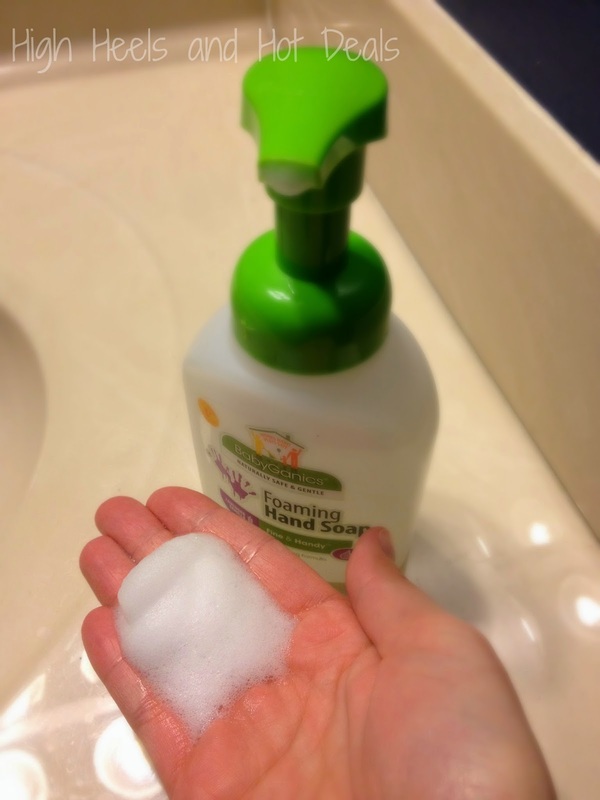 This foaming hand soap has a moisturizing component in it so not only is he washing away the germs, he's keeping his hands soft and sweet. Plus BabyGanics Foaming Hand Soap is non-allergenic and free of yucky things like parabens, sulfates and artificial fragrances or dyes. My kiddo's skin is important to me so it's reassuring to know that this company is completely geared towards the safety of our little ones. 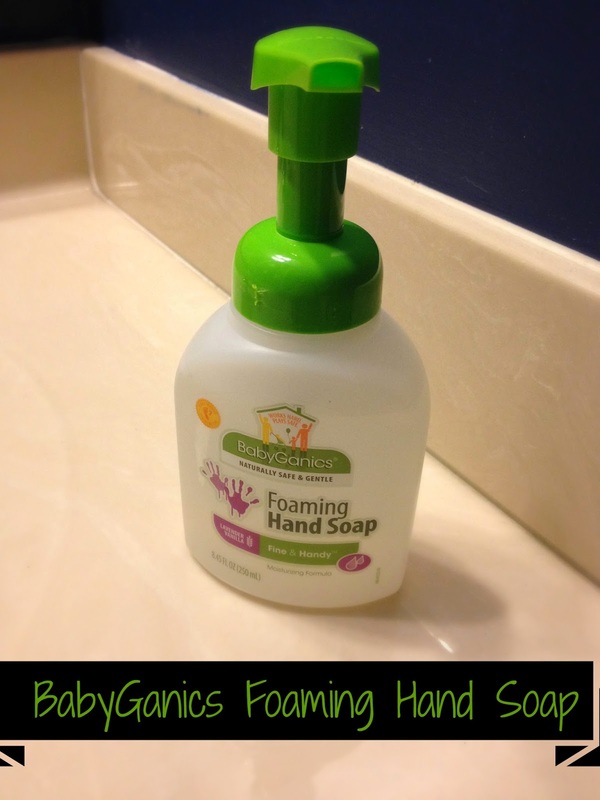 After my experience with BabyGanics Foaming Hand Soap, I definitely plan on trying out more of their products. 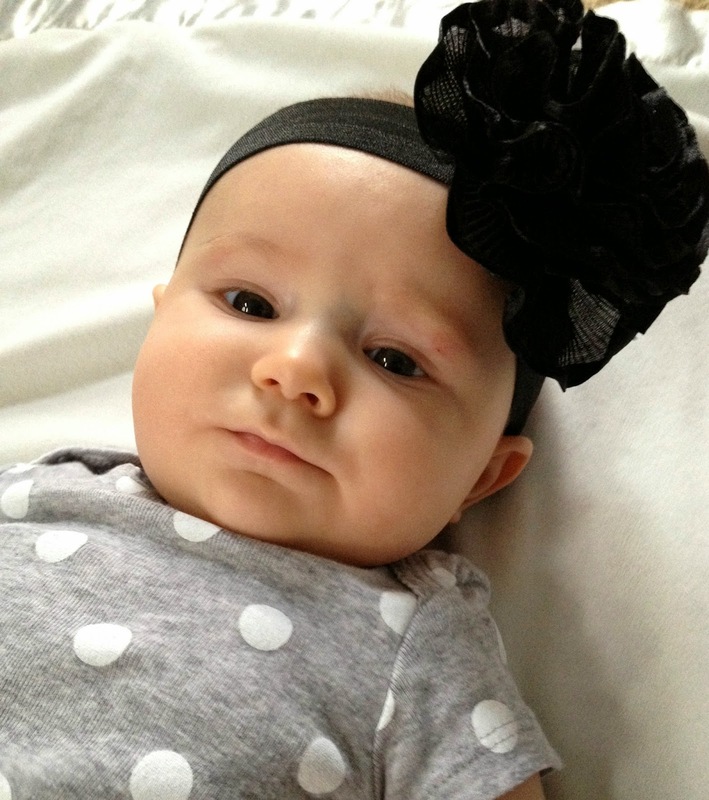 The message of a baby-safe world that BabyGanics portrays makes me want to see what other items my family can enjoy. As a mom it's comforting to find a company that strives to create products with high standards and safe and non-toxic ingredients. 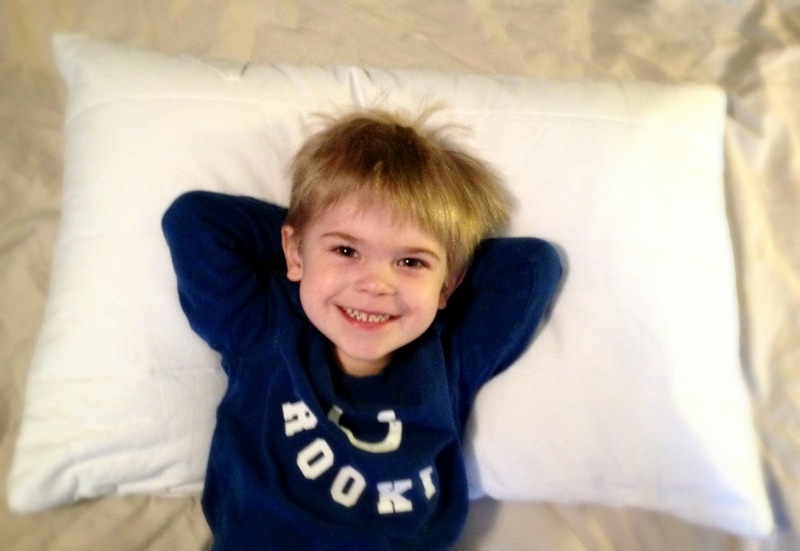 BabyGanics listens to parents and it shows in the quality that they produce. Check out what BabyGanics has to offer and be sure to follow them on social media! Disclosure: I was provided a product sample for my honest review. All opinions are 100% my own. Lola decided to turn four months next week. I'm not quite sure how that happened so fast! Girlfriend is a moving and grooving little thing. She is cooing and making noises and loves to grab and grasp things (especially my hair). I like to call her Hercules because girlfriend has a serious grip - especially when it comes to mama's hair. But she's all about kicking her legs and moving her arms and focusing on different objects and colors. Clearly she gets bored quickly when I lay on a blanket with a few toys. Lola is extremely social and needs things to be exciting and intriguing in order to entertain her. 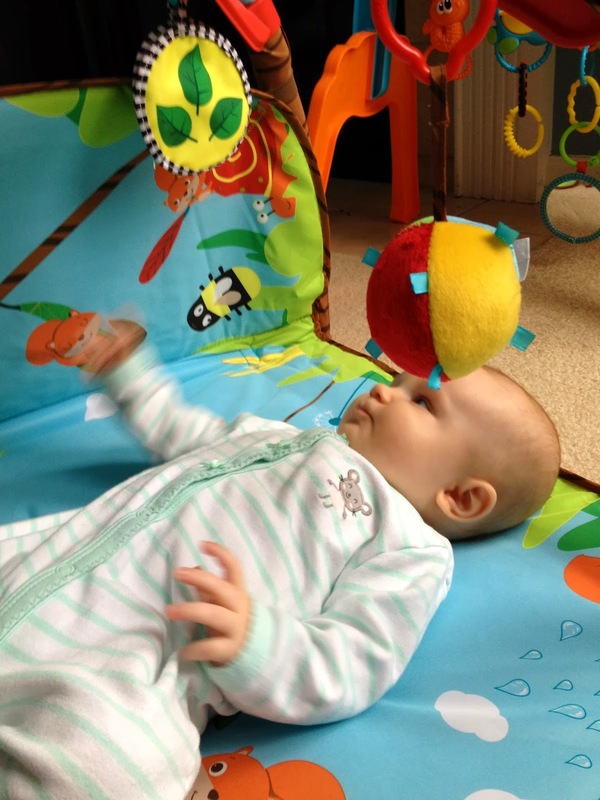 TinyLove Gymini Developlace Play Mat has been the perfect addiction to Lola's daily dose of entertainment. One of my favorite features of this play mat is how it grows with your child's age. Whether it's tummy time or independent play, the Gymini Developlace was created to entertain your tot through their toddler years. Right now Lola is all about reaching and grabbing toys. I love being able to place her on this mat and let her work on her motor skills by being able to grab at the toys hanging above and around her. 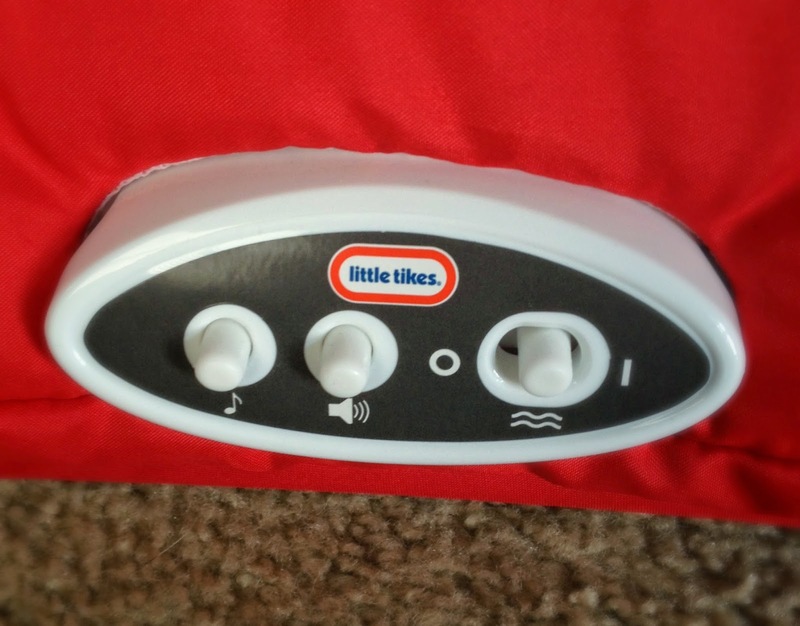 The kid also hates tummy time but we all know how important this time is for a growing infant. Another fun feature that I love about the Gymini Developlace mat is the sides that fold up or down so I can make it longer for her to roll around on or more compact to practice her dreaded tummy time. There is even a fun little Peek-a-boo window that I can look through and talk to her while she does her tummy time so I'm at her level. It makes the screaming a little more tolerable. Right now my poor kiddo is teething so the drool is something fierce these days. I'm constantly washing her toys or wiping them up, but sometimes the fabric doesn't allow me to be able to wipe it clean. This play mat has a smooth fabric that lets me wipe up drool or spit up easily and doesn't leave marks or stains like other fabric. 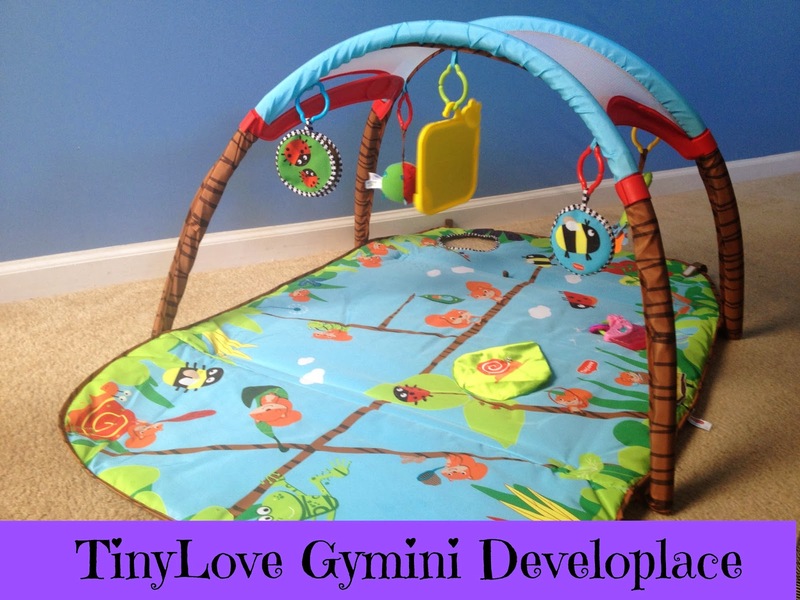 Tiny Love Gymini Developlace is loaded with tons of great toys and learning features. 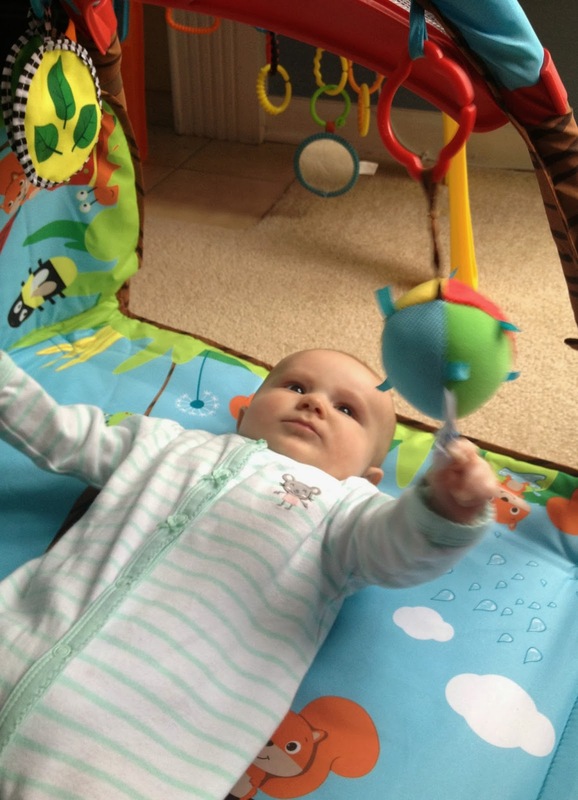 These things are perfect to help strengthen and grow your little one's senses and motor skills. Lola's favorite is the Soft and Crinkly Play pal. This little squirrel has a hook so she can bat it above her head or I can let her hold it and she can explore the texture and noise it makes. She also loves to kick at the the soft ball rattle that we hang above her. 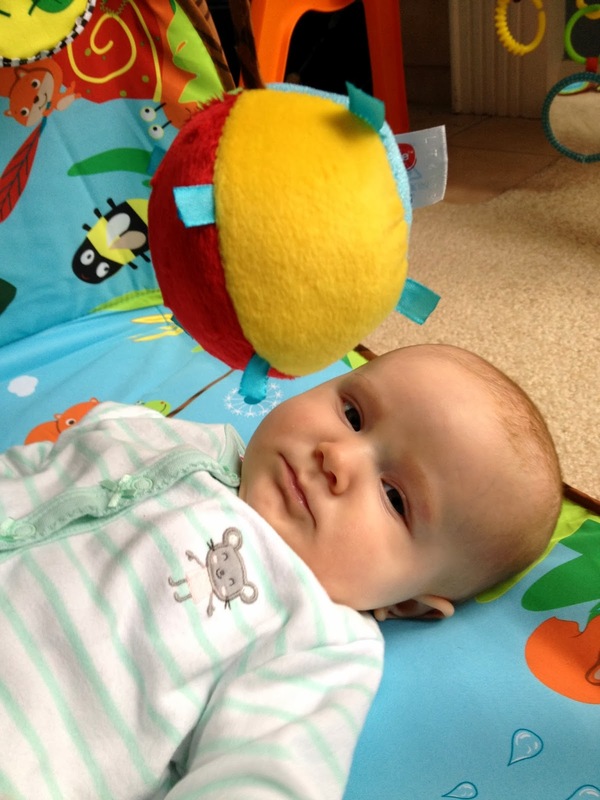 Another fantastic toy feature is the mirror because what baby doesn't love to look and smile at their own reflection? The TinyLove Gymini Developlace is sure to offer your little one tons of fun playing and learning time. Lola is just starting to explore her surroundings but I can see how this mat will grow with her as her skills get stronger and she becomes more aware of the sites and sounds that are around. 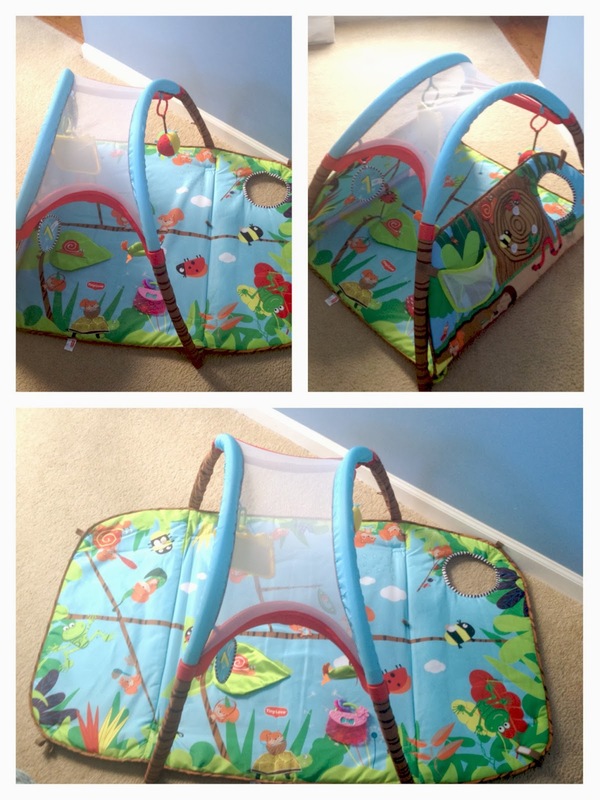 Whether it's your newborn baby or your busy toddler, this play mat if full of fun and exciting features that are sure to offer your little one an enjoyable play experience. 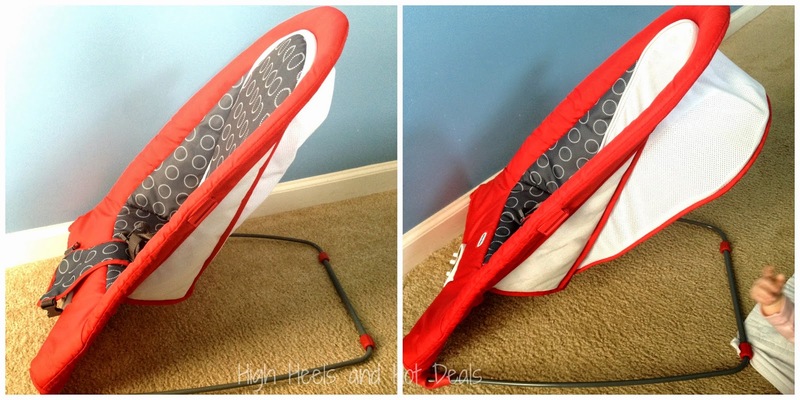 --The TinyLove Gymini Developlace Activity Mat retails for $79.99. 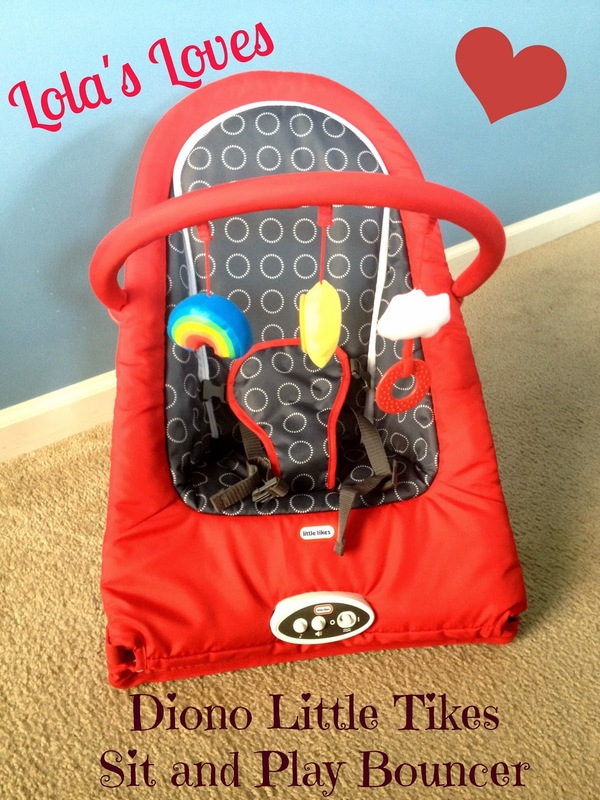 For more information and to check out other TinyLove products, visit their website. 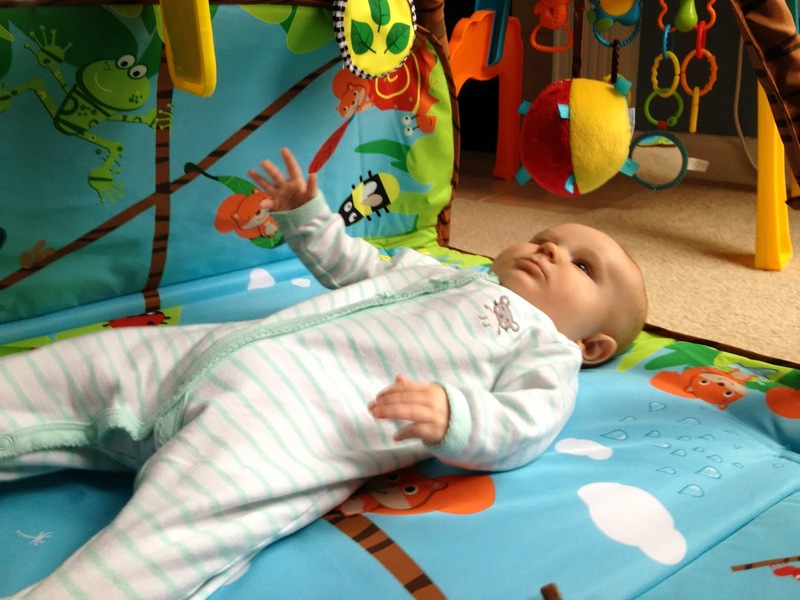 --One (1) lucky winner will win their very own Gymini Developlace play mat. Follow the Rafflecoptor below. Disclosure: I received a product sample for this review. All opinions are 100% my own. It's another sunny day here in central Indiana. I'm waiting for little guy to head down for a nap so I can head outside and get in my 4 miles for my training. It's still a little frigid but remember, the sun is out!?!? --Almay Intense i-shadow, liner or mascara - $5.99 and get $6 ECB when you buy 2. Use $5/2 printable. Final Price: $0.49 each when you buy 2 afer ECB -- STOCK IT UP!! --Irish Spring Body Wash - 3/$9 and get $3 ECB when you buy 3. Use $0.50 off (SS 3/9). Final Price: $1.50 each when you buy 3 after ECB. --Colgate toothpaste - $2.99 and get $1 ECB. Use $1 off (SS 3.9). Final Price: $0.99 after ECB. --Easter M&Ms - 2/$6 and get $1 ECB when you buy 2. Use $1.50/2 M&Ms (RP 3/2). Final Price: $1.75 each when you buy 2 after ECB. --Hershey Kisses, Minis, Eggs or Cadbury Mini Eggs - 2/$5 and get $1 ECB when you buy 2. Use $2/3 (SS 2/23). Final Price: $1.50 each when you buy 3 after ECB. Any great deals at your CVS store? Whoo hoo! We all love Disney, right? How about your chance to win a super sweet Disney Pack? 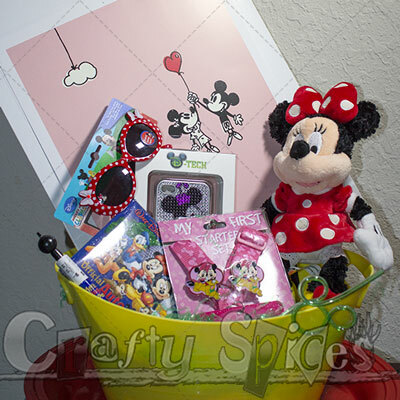 Crafty Spices is sharing her DisneySide with us and hosting a Disney Pack Giveaway. Join for a chance to win via the Rafflecopter below. This contest is open to all U.S., Dominican, and Canada residents age 18 and over, void where prohibited. Disclosure: This post is in conjunction with Disney Parks and MomSelect. We did not receive any type of compensation for this post. Jay did receive a party pack complimentary from #DisneyParks to host a #DisneySide @Home Celebration, promoting Disney's new campaign "Show Your #DisneySide". We are not responsible for shipment of prize, for details please contact Jay. This has been a week of battling colds and children deciding sleep isn't a priority. Some days I think, "When am I just going to crash?" I see a good, long nap this weekend. 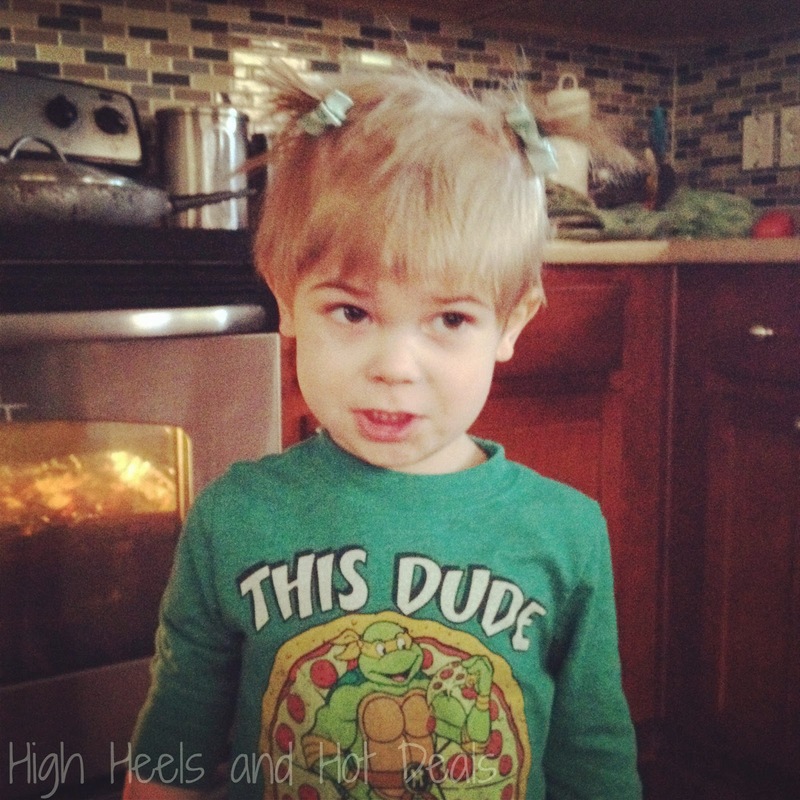 The transition to a mommy of two is hard enough, now throw illness into the picture and you've got double the trouble. However I did finally manage my first run outside today! 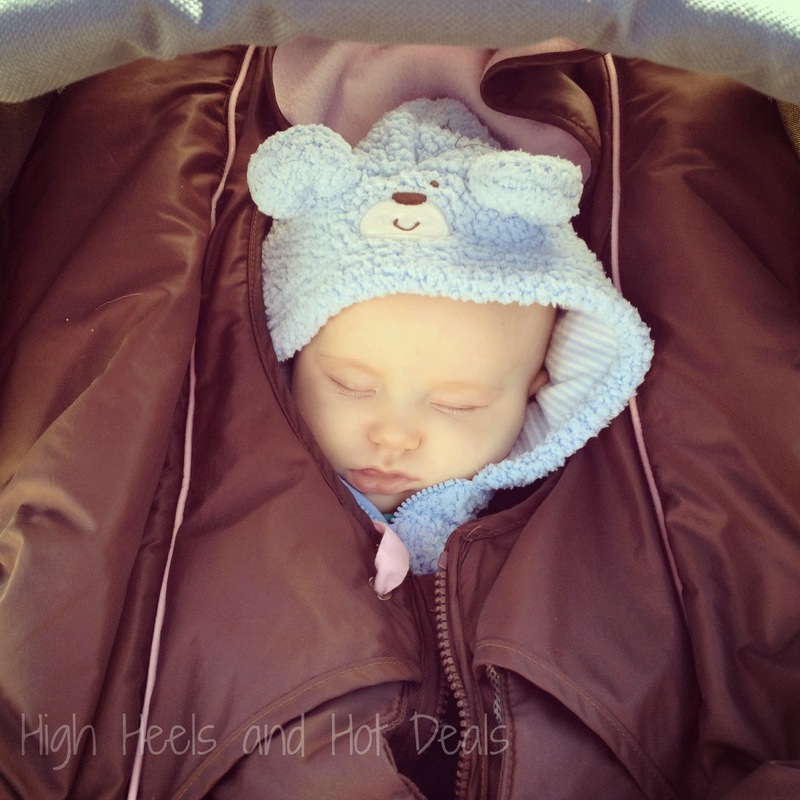 It is sunny and in the 40s so I bundled my girl up and hit the Monon Trail here in Indy. P.S. 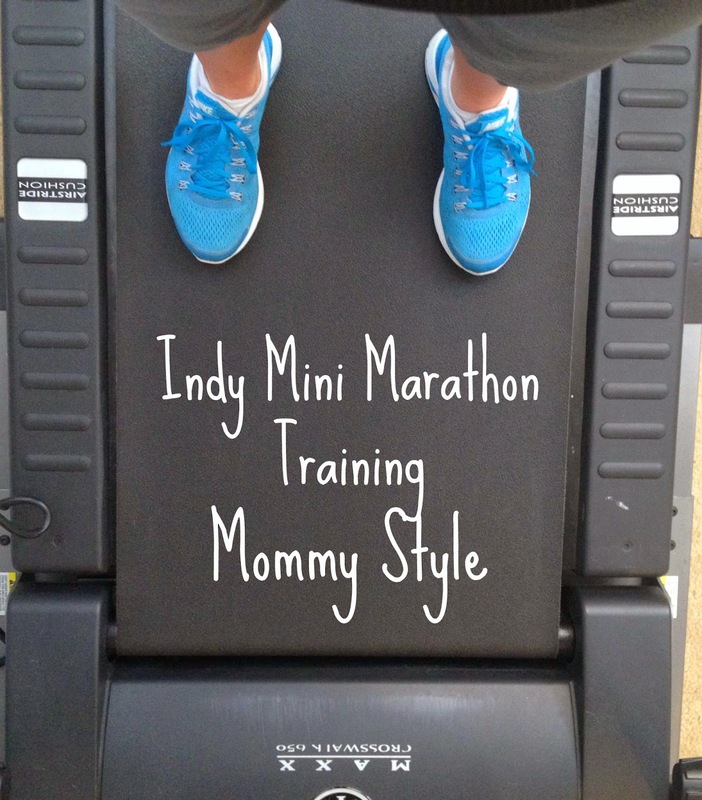 Pushing a stroller and running is 293482 times harder than on a treadmill. Especially with all these bridges and inclines they've recently added to the trail- holy cow! As I've said before, I really just want to be able to run this entire race. I don't care if it's at the pace of a snail, I am determined to just keep going. I need to up my water intake. I've been so bad about it lately and it's so important, especially to keep my supply up too! I also plan on getting a few more outdoor runs in this week since Monday and Tuesday will be in the 60s....holla! !